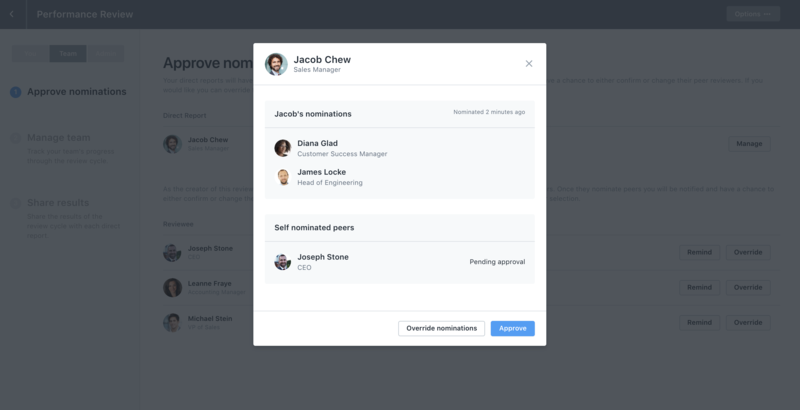 During the peer nomination phase of a review cycle, there is the option to allow employees (who are being reviewed in that cycle) to nominate themselves to review their peers. 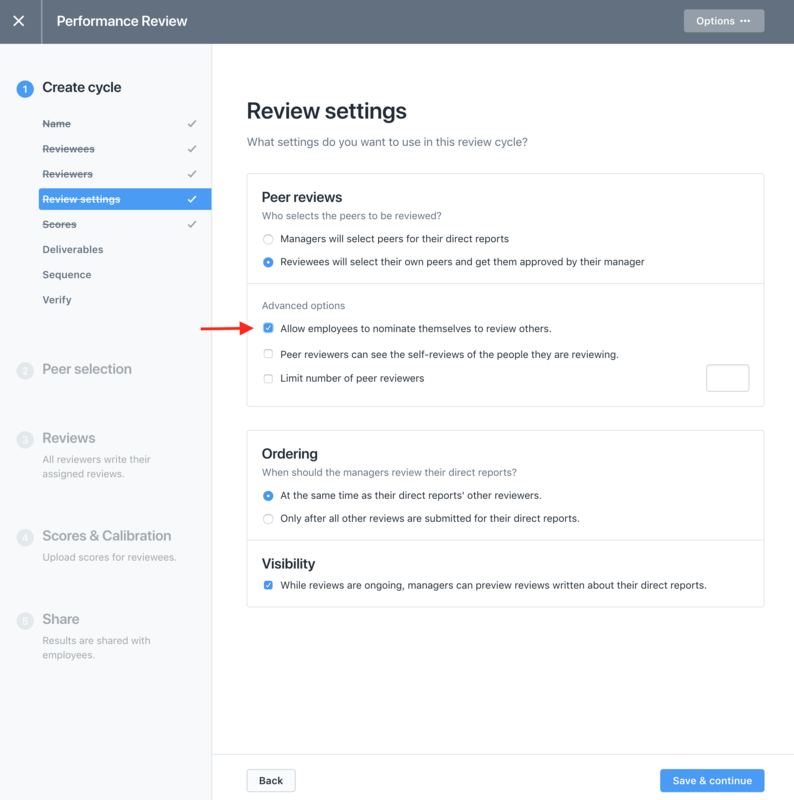 Step 3: Under Advanced Options, check the box that says "Reviewees will select their own peers and get them approved by their manager" and then "Allow employees to nominate themselves to review others"
From here, they will see the ability to both nominate their peers to review them, as well as opt-in to review one of their peers. 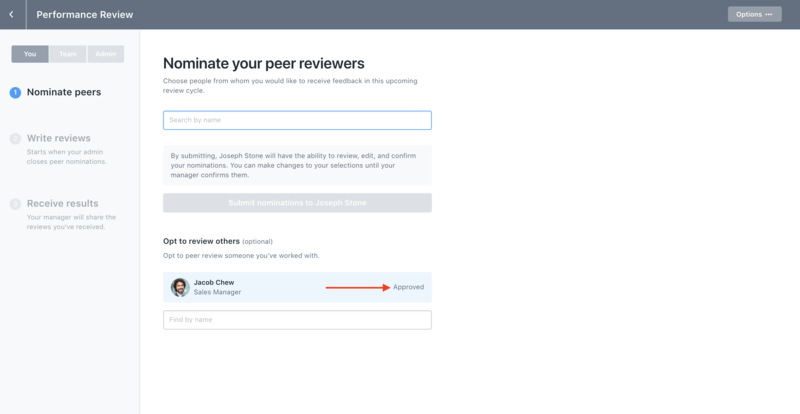 Note: You will only be able to nominate yourself to review peers if you are being reviewed in the review cycle. Once a direct report has submitted their own peer nominations, the manager will go into Lattice to approve them. When the manager clicks into approve the peers, they will see if anyone else has nominated themselves to review their direct report. What happens if I request to review someone and the manager has already approved their peer nominations? The manager will receive an email notification with a link to approve the self-nominated peer. If they never approve that peer, the peer will not be included in the employee's peer reviewers list. 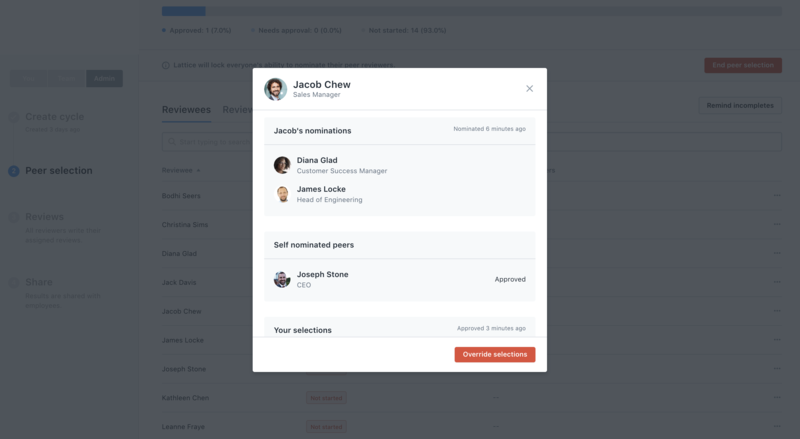 From the self-nominated view, the employee will see an automatic "rejection" next to the name of the peer they chose; however, if the manager takes action on the request and approves it, it will move to "approved". What happens if I nominate myself to review an employee, that employee also chose me to review them, and their manager has already approved me as a peer reviewer? You will be automatically approved to review that peer. What happens if my manager never approves my peers? Any peer review nominations (whether by a peer or by yourself) will be automatically approved. Admins always have the ability to approve and override as needed if managers are unable to do this. What happens if the peer list is over the maximum threshold set by the admin during the setup? We will still limit employees from choosing over that limit when they are nominating peers to review themselves. However, if other employees at the company (outside of that list) want to review that employee, we will allow it (even if it's over the maximum threshold). Example: Let's say you set the maximum peer nomination limit to 5. Jacob goes into Lattice and chooses 5 peers to review him. His manager approves all 5 peers. Let's say James wants to review Jacob and self-nominates himself. We will still send that request to Jacob's manager and if Jacob's manager approves, then James will also review Jacob - which will set the total amount of peer reviewers for Jacob to 6. Again, the maximum limit is around how many peers an employee can choose to review them. It does not limit people opting in to review someone else. How can I tell as an admin who the employee nominated vs. who nominated themselves to review that employee? When you click on "View peer reviewers" and you will see the details of who was nominated how.